Monsoon is the season of abundance. 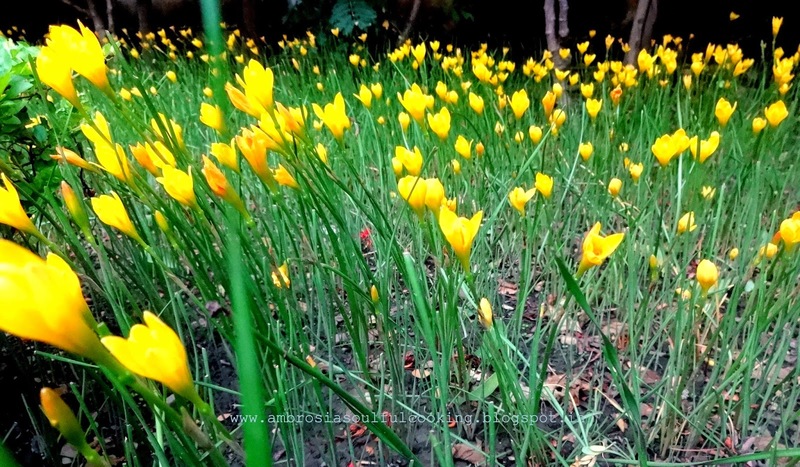 Thousands of rain lilies in the lawn present a beautiful contrast to lush grass that is growing taller day by day. We tread carefully as hundreds of red patches in the lawn are the tiny baby centipedes huddled together. Our pond is teeming with thousands of tadpoles crisscrossing the length and breadth of the pond whole day. Dragon fly babies have almost completed their larval stage and will fly out soon. Our cat is being well fed or over fed these days lest she should eye the baby birds that have left the nest and are perched on the lower branches of Magnolia. They are still being fed by the parents and very soon they will be on their own in the big big world rife with dangers, facing vagaries and struggling to survive. Nature is pulsating with life, all life forms are thriving and flourishing! Mango season will soon be over. It will be one year till we get to bite into the juicy mangoes. 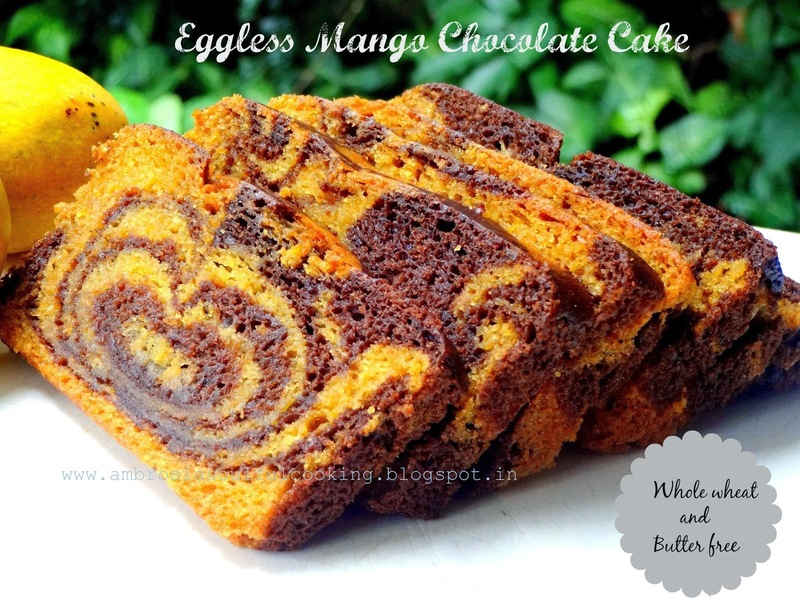 My love for mangoes and love for chocolates had me have them both in a cake. I baked an Egg less Whole Wheat Mango Chocolate Cake. Preheat the oven to 200 degrees. Grease and line the bottom and sides of one 6 inch round cake pan. 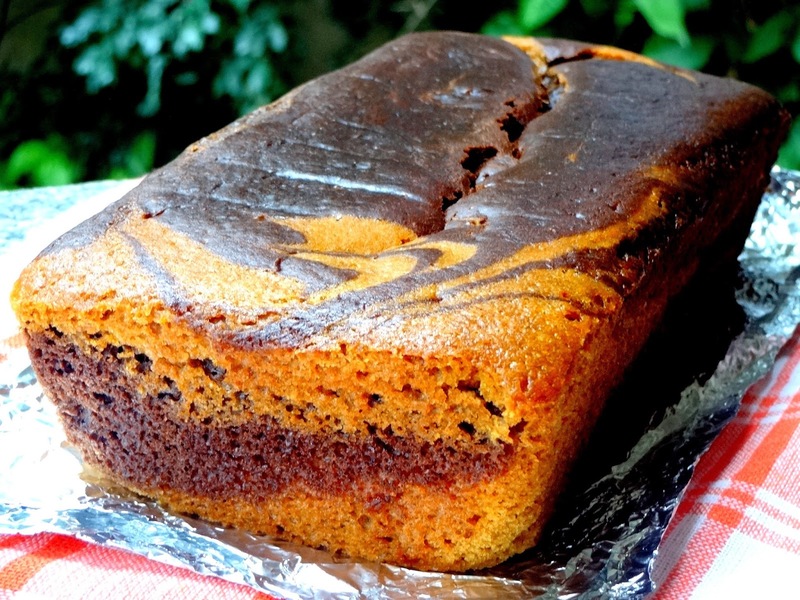 You can also bake the cake in one 9 inch x 4 ½ inch loaf tin. Mix mango puree and yogurt in a deep bowl. Add sugar. When sugar dissolves, add baking powder and soda. Mix well and let it bubble for 3 minutes. Add olive oil and vanilla essence. Whisk together whole wheat flour and salt. Add to wet ingredients in three shifts. Mix gently till there are no lumps. If the batter feels too dry, add some milk to get the right consistency. Divide the mixture into two parts. To one part add melted chocolate and mix well. Ladle the batters alternately into the pan starting with the plain batter. Swirl with the back of a spoon. Bake at 200 degrees C for 12 minutes. Reduce the temperature to 180 degrees C and bake for 45 to 50 minutes or till the top turns and cake shrinks from the sides or when a toothpick inserted in the center comes out clean. Tent loosely with a foil if the cake browns too fast. Remove from the tin after 10 minutes. Invert on the rack. Slice next day. 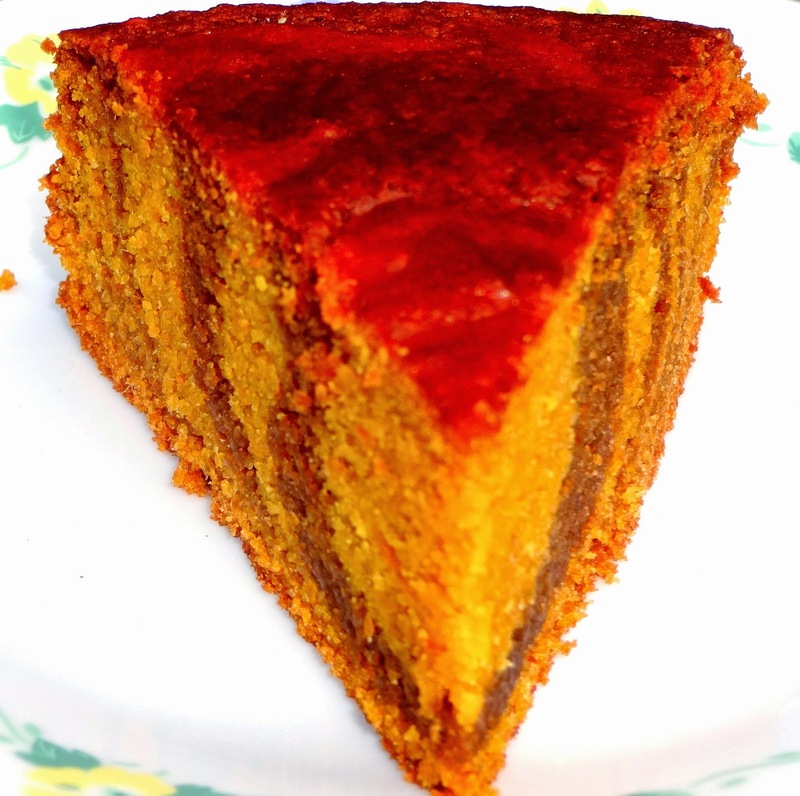 My notes: Mango puree adds colour and softness to cake. The flavor of the mangoes is not too strong. The cake slices really well when kept in the refrigerator. It is moist and healthy snack cake. I can imagine how wonderful and amazing it is to be amongst nature and whenever I hear about cats I wonder how much Vaanya will enjoy. The cake looks stunning ...lovely swirls of two awesome flavours.